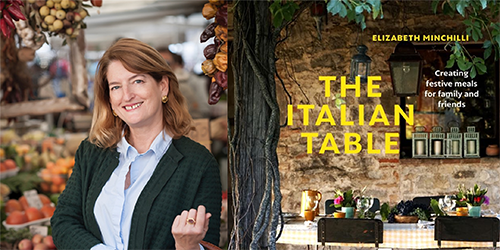 Travel writer and cookbook author Elizabeth Minchilli will share her insights on Italian cuisine and culture at a five-course Italian dinner based on recipes from her book, "The Italian Table" at the Fourth Estate restaurant on April 24. Combining menus and recipes with visual experience and inspiration, "The Italian Table" is a practical resource that will help home cooks and hosts recreate these fabulous meals and celebrations at their own tables. The evening begins at 6:30 p.m. at the Fourth Estate restaurant with hors d'oeuvres featuring six different Italian specialties. Tickets cost $95 per person, with a discount when buying two ("couples") tickets. NPC members are eligible for a 15% discount, but you must be signed in to access the discount code. Individual tickets includes a copy of the cookbook. Couples tickets include one copy of the book. "The Italian Table" is Minchilli's ninth book. She has tackled such topics as the famed ceramics of Deruta, the intimate studios and salons of Rome's artists and designers, and the style of the Tuscan farmhouse. Her true passion, however, is Italian food. Minchilli has eaten her way through Rome since she was 12. She knows the tastiest gelato and the best spot to sip a Negroni. Her previous book, "Eating MY Way Through Italy," shared her tips for exploring Italy's diverse regions -- from pizza in Naples to anchovies in Amalfi. The menu, listed below, will also include appropriately paired cocktails and wines.